The GFOA's latest publication on performance management presents findings from over two years of research into identifying trends and leading practices among public sector practitioners across the United States and Canada. The book explains essential components of a performance management system including budgeting, citizen participation, evaluation, management, and technology and provides strategies to help governments use performance management as a tool to be more accountable, make better decisions, and ultimately improve services. 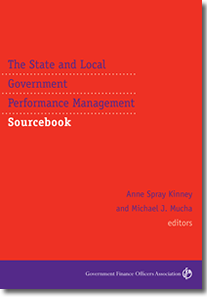 The book also contains the results from GFOA's research, including a listing of public sector performance management efforts.